30g / 1oz unsalted butter, melted. 225ml / 8fl oz milk, warmed to blood temperature. Heat the oven to 190 degreec C / 375 Degrees F / Gas mark 5. Line a muffin tin with paper muffin cases or grease the tin well and line with greaseproof paper discs. Sift the flour, cocoa powder and bicarbonate of soda together into a big bowl. Add the sugar. Make a well in the centre and add the banana, chocolate chips, egg, butter and milk. Mix well and pour into the muffin cases. 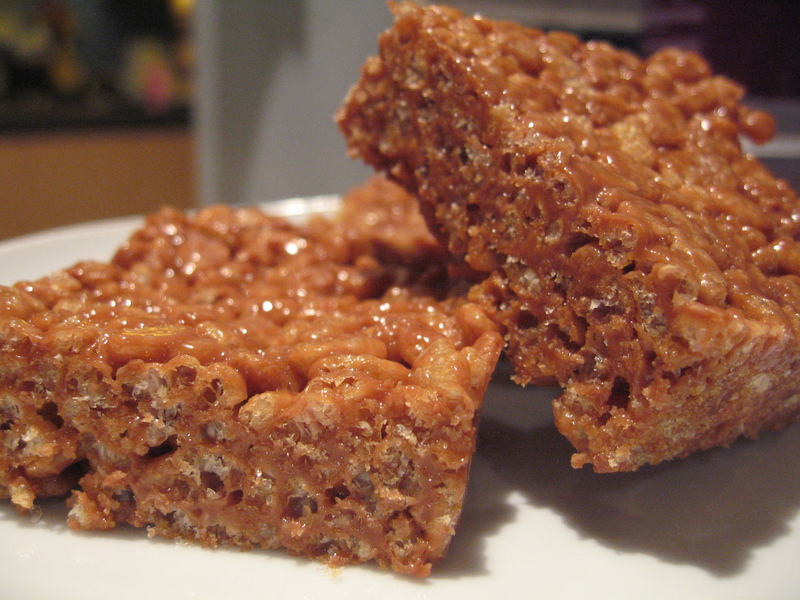 Bake for 20-25 minutes or until the tops spring back when pressed lightly with a finger. Cool on a wire rack. Preheat the oven to has mark 6 / 200 degrees C. Line a 12 bun muffin tin with muffin papers. Combine the flour, bicarbonate of soda, baking powder, and spices in a large bowl. Whisk the egg in a large measuring jug then add the sugars, breaking up any lumps. Add the milk and vinegar then measure in the oil with a tablespoon. Use the same oily spoon to add the syrup and treacle so they don’t stick to it. Whisk the mixture to combine and add to the flour and spices. Stir until mixed but still fairly lumpy – the mixture may be more runny than you expect for muffins – but you need the dense stickieness of gingerbread, rather than a cakey crumb. Spoon or pour the mixture into the muffin papers and bake for about 20 minutes until the tops are dry; the muffins will still feel squidgy when you take them out of the tins to cool on a rack. Note that because the mixture is moist, these muffins will not have the hump topped look of shop-bought ones. 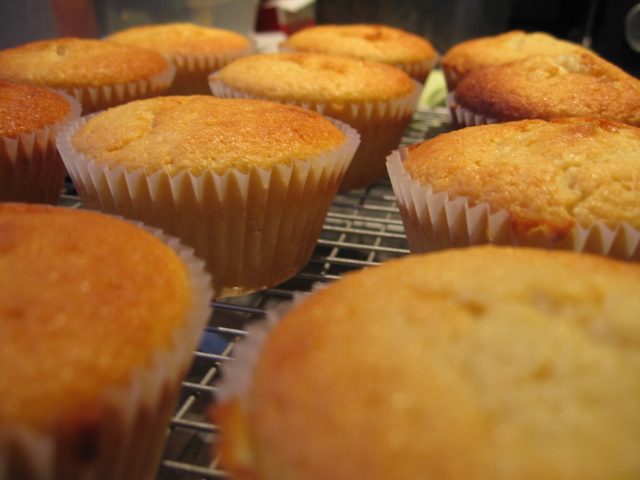 But unlike other muffins, these still taste gloriously good a couple of days after baking. I watched these being made the other week whislt watching the River Cottage tv programme and thought I would give them a try.. I have to admit that I am not a lover of beetroot, but then that’s probably because I associate it with the pickled stuff that comes in jars, tasted it once when I was a youngster and its kinda stuck in my head that I dont like it..
Time to give it another try, if Hugh Fearnley Whittingstall can convert non-beetroot lovers that it is a truely versatile veg then I think I should give this glorious purpley-red globe the benefit of my doubt ! 1. Preheat oven to 180°C/350°F/Gas Mark 4. Grease a baking tin of approximately 20 x 30 x 3cm and line the bottom with baking parchment. 2. Break up the chocolate into pieces, cut the butter into cubes then mix them up a bit in a heatproof bowl. As the oven begins to warm up, put the bowl onto one of the shelves for a few minutes until the chocolate and butter starts to melt. Stir, and put back into the oven for a few more minutes to melt completely. 3. Whisk the eggs and sugar together in a bowl until combined, then beat in the melted chocolate and butter until smooth. 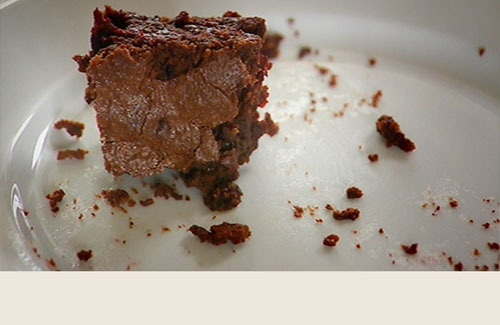 Gently fold in the flour then the beetroot – be careful not to overmix or it will make the brownies tough. 4. Pour the mixture into the prepared tin and smooth over the top with a spatula. Bake for about 20 minutes. 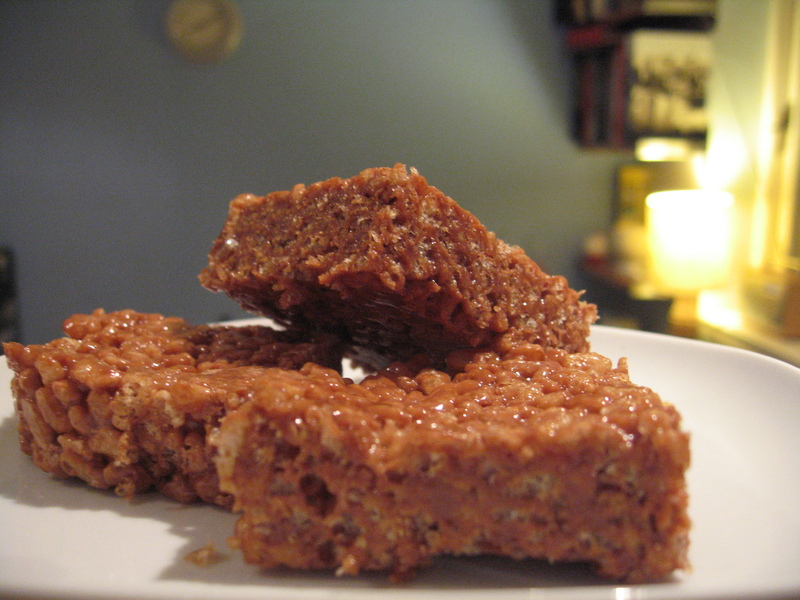 A knife or skewer pushed into the middle should come out with a few moist crumbs clinging to it. Don’t be tempted to overcook them! Remove the tin from the oven and leave on wire rack to cool before cutting into squares. Be careful not to overmix or it will make the brownies tough. I made this cake yesterday, we had friends round for a spot of supper and this yummy cake and a nice pot of tea finished the evening off. Beat in the teaspoon of vanilla essence. Bake in a pre-heated oven at 180 degrees C for 35 mins or until a skewer inserted comes out clean. Leave to cool for 10 mins then turn out to cool firther on a wire rack to cool completely. Once the sponge has cooled completely slice the sponge in half to make 2 sponges, a top and bottom. I used my homemade strawberry jam, and spread a layer evenly over the bottom half of the cut sponge cake, place the lid back on top. Take a carton of double cream and beat until a nice smooth thick consistency is reached. Spread the cream over the top of the sponge cake with a pallet knife. 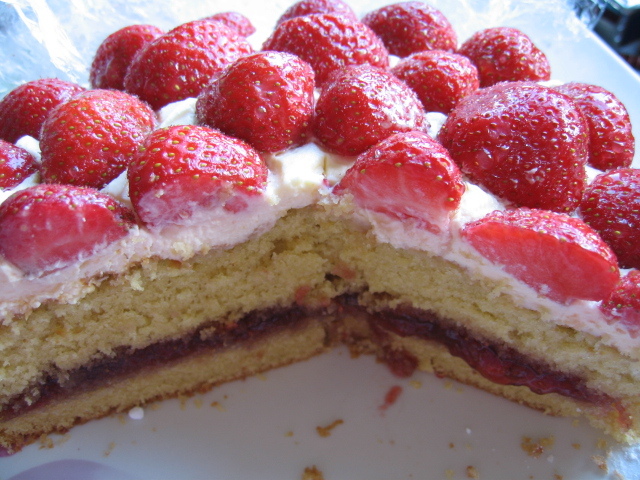 Take a punnet of fresh strawberries remove the husk and slice each strawberry in half, cover the top of the cream covered cake in the strawberry halves. Just before serving put a teaspoon of icing sugar into a fine sieve and dust the icing sugar lightly over the cake. I love being off work, I get to be with the kids, my pets and play in my kitchen till my heart is content.. This morning I made the kids pancakes for breakfast, they had maple syrup, homemade raspberry, strawberry and blackcurrant jam on them, they were absolutely delicious (I must put my recipe on the blog). Soooo I’m thinking I might just have a bit of an addiction where it comes to cupcakes/fairycakes, they are just easy to make, and I looove coming up with different toppings for them .. 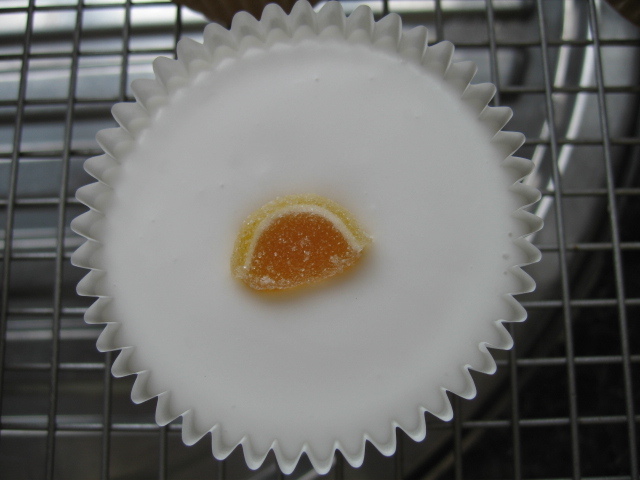 I was flicking through some old magazines yesterday and came across this recipe for cupcakes/fairy cakes, the recipe itself is completely different, using Yoghurt and ground almonds, so I thought I would give them a try. Line a 12-hole muffin tin with paper cases (muffin sized ones) and heat oven to 190 degrees/gas 5. In a jug mix the yoghurt, eggs and vanilla extract, put the dry ingredients, plus a pinch of salt into a large bowl and make a well in the middle. Add the yoghurty mix and melted butter, and quickly fold in with a spatula or metal spoon – don’t overwork it. Spoon into the muffin cases (they will be quite full) and bake for 18-20 mins or until golden, risen and springy to the touch. 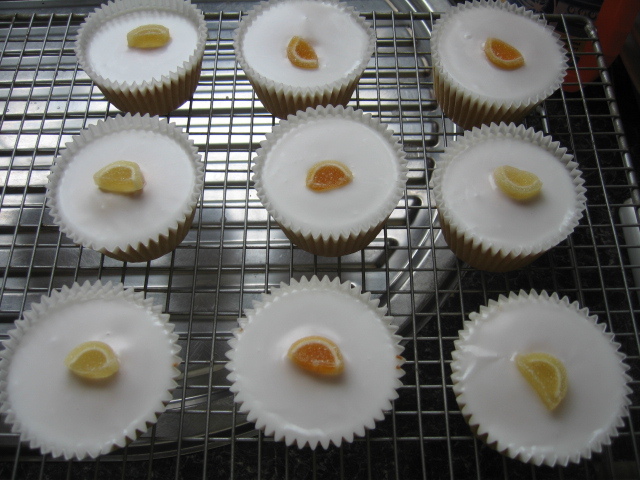 Cool for a few mins, then lift the cakes onto a wire rack to cool completely. Melt 100g white chocolate in the microwave on high for 1 1/2 mins, stirring halfway. Leave to cool. Beat 140g Unsalted butter and 140g Icing Sugar in a large bowl until creamy. Up to 48 hours before serving (or the day before if its really hot, bring back to room temperature, then spread over the cakes. Put the ribbon around the cakes now if you like, tying or glueing in place. Keep cool and out of direct sunlight. I made them this evening, and will decorate them tomorrow morning when they are completely cooled with the White Chocolate Frosting… providing there are any left! I have had to throw one to the dogs already because Hovis our Birman cat decided he fancied one… cheeky bloomin cat! half a packet of white choc chips. Mix the sugar and mararine together until pale and fluffy. Add the self raising flour and mix well. 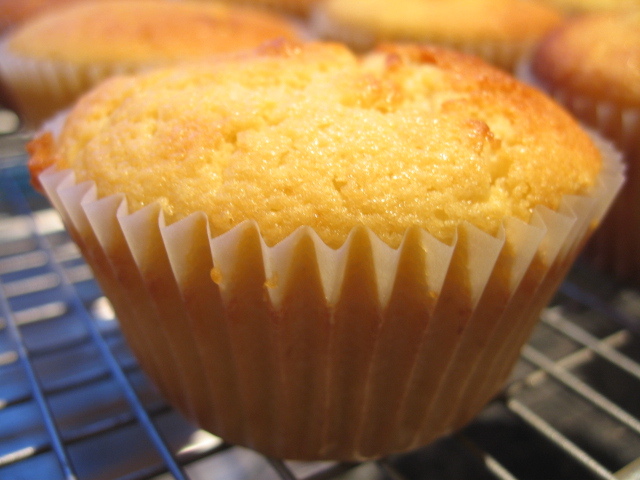 Put 12 paper muffin cases into a muffin tin and distribute the mixture evenly. Sprinke about half a dozen choc chips on top of each uncooked cake. Bake on the middle shelf of the oven 180 degrees C for 25-30 minutes, once cooked, remove from oven and allow to cool completely. 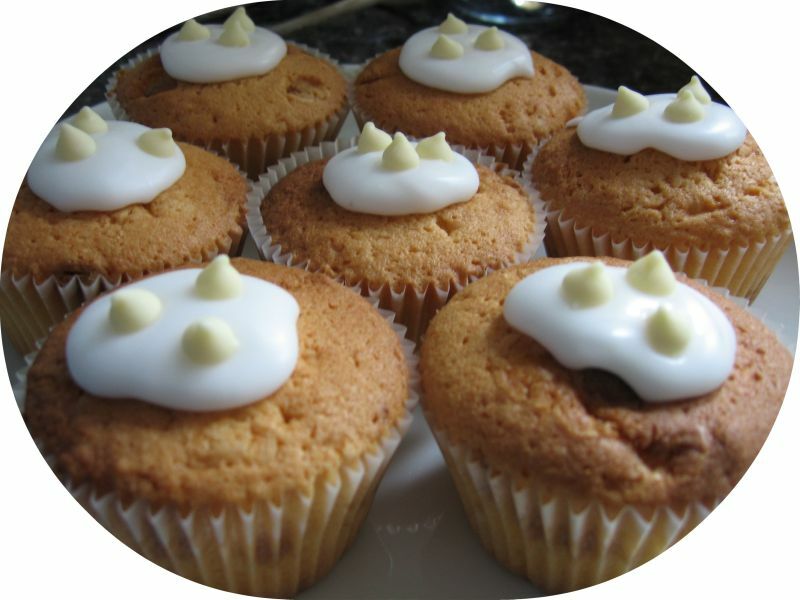 Mix up a small amount of icing sugar and put a dollop on top of each cooled cake and top with choc chips.